Depending on your personality and how much time you have you will either find Tops overwhelming or exhilarating. It is hard to conceive of a more eclectic liquor store, both in terms of the products on its shelves and its clientele. -Several college students devising optimum strategies for how to most efficiently get drunk and make huge mistakes which will possibly severely hamper their lifetime earning potential (to be expected given Tops' proximity to ASU). -I also saw several other professionals just getting off from work; these were most-often perusing the neatly-laid-out wine section (in contrast to the free-for-all which is the liquor section). -Then there were the clearly homeless folks looking to get their fix. -And finally the college student who was buying a large Red Bull and a Blue Moon (if this admixture isn't called a "Red & Blue" it is more of a crime than combining these two in the first place). When not people-watching I was busy perusing the whiskey selection -- not an easy task given the "layout" of the liquor section. If I'd had an hour this would have been a fun process, akin to a treasure hunt. As it was, it was somewhat infuriating that I'd glance a Willett Rye hidden behind a Wild Turkey 101, and a High West 21 in the back of a locked cabinet which I was only briefly allowed to peruse given the one staff member who had to attend to all the desperate-to-get-their-drink-on college students with their Jager and PBR. Still, I was pleasantly surprised by their large selection of both rare and local/craft whiskies. They had whiskies from Washington, Montana, and two from Arizona. They also had the Wild Turkey 101 Rye which is a pretty good find. Ultimately I picked up the Dickel No. 12. I'll post a better review later, but the short notes are this: Dickel is not remotely complex, but it is darn-good down-home Tennessee whiskey. Too sweet for my everyday consumption, but good for when I'm craving something syrupy-sweet. If you have to choose a Tennessee whiskey, this is far-and-away superior to Jack Daniels, and for $20-$22 you don't have to take my word for it; go to Tops and pick up a bottle. As an employee of tops, I have a feeling you were in during a very busy time. It is an establishment that is best digested over series of visits at varying times. 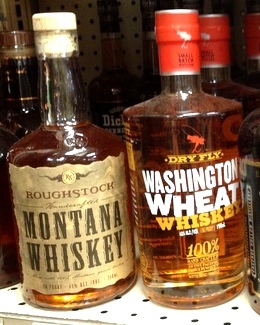 We c have way better whiskey than turkey 101 rye! It is always frustrating for us that we don't get the time to assist the discerning customer with their choices once it is busy. Never be afraid to let b one of us know what you are wanting to look, day time is the best for whiskey though. Thanks for taking the time to comment, Bill! I recently did go back (though on a Saturday night - probably not much better of a time than my previous visit); I found this year's Parker's Heritage which was a great find. I absolutely recommend Tops to friends as Tops does have a great selection, but I do warn them that they should go when they have sufficient time, and ideally not during a weekend unless they want to contend with ASU students recovering (or preparing?) for midterms.